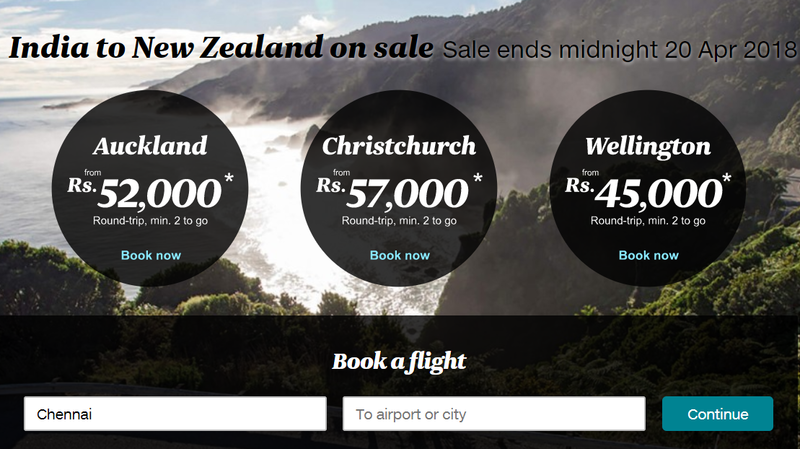 Home / destinations / sale / Air New Zealand India Sale- Worth it? Air New Zealand India Sale- Worth it? 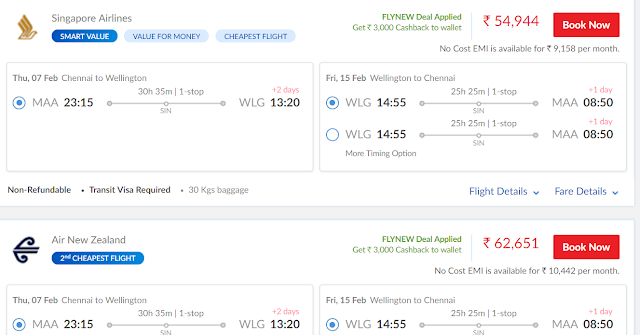 Air NewZealand is currently running an India Sale, promising a return ticket from India to New Zealand for INR 45000 onwards. Is this a good deal? I am sharing my analysis in this post. What is the cheapest way to reach New Zealand from India? Cheapest way is through AirAsia- you can get India- Auckland return ticket for INR 20-25k during Air Asia big sale, depending on which airport you begin from. I have a Chennai- Auckland return ticket for INR 23600+ - this is the cheapest it can get. But above fare doesn’t include baggage and meals. Note that AirAsia’s cheapest ticket is not available all the time- only during their Big Sales which happens 2-3 times an year and only a few seats per flight are sold at this low fare. Air Asia’s normal fare (like 3 months before) will cost close to 40k return without bags and meals, which is about 50K+ or almost as much as Air NZ fare. What are the advantages of Air New Zealand flights? You will get SGD 20 coupons for use in Singapore’s Changi airport (Worth about INR 1000). If you have 5 hour + transit time, you can avail free Singapore city tour organized by Changi Airport. More value for your money. Changi on any day is a better airport to transit through, compared to other airports in the region. Is this Air NewZealand India sale good? As I showed earlier, if you need baggage and meals, then even Air Asia’s cheapest ticket (which isn’t available all the time) will cost close to 35k which is about 20-25 savings over next best option. If you prefer some luxury and don't mind spending a bit extra, Air New Zealand deal will appeal to you. The sale sales, promised fare is applicable if booked for min 2 pax. If you’re planning solo, you may not get the lowest rates. I tried multiple date combinations- couldn’t find the lowest fare as shown above, but found rates within 10-15% of the lowest fare advertised. You can try for your origin city and preferred dates- may be you will get lucky. Note that fare shown is in SGD (1 SDG =50 INR) and your bank may charge an additional fee for payment made in foreign currency. The cheapest flights seem to be from Delhi. Check here for prices from your city. Sale is ON till 20th April- you’ve another week to decide. 50-60k is not super cheap, but reasonable. If NZ is on your cards and the price seems reasonable and affordable to you, go ahead and book. If you try hard, you might get some destinations in NZ for a lower price- like 40-45k on SQ or MH. Do check. Please cross check the fare once on Singapore airline. For the example below, I found SQ around 7k cheaper than Air NewZealand- timings are exactly same, so I guess flights are also same. In a code share arrangement, usually booking with airline that operates the flight will save you a few bucks compared to airline that only has codeshare agreement. So do cross check once before buying. New Zealand visa will cost approx. INR 8000-1000 per person. NZ is an expensive country, so do plan your budget accordingly. Visit Air NewZealand's exclusive India website to check fares and book. Let us know what you think of the deal. Malindo Air bags 2 significant awards! New airport near Byndoor, Udupi!